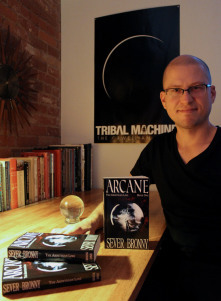 According to his own website, Sever Bronny of Victoria previously released three music albums with his "industrial-rock project"; Tribal Machine, including a full-length concept album called The Orwellian Night, prior to e-publishing the first volume of his planned five-volume fantasy-adventure series, Arcane (2014), a 349-pager available via Amazon. Whereas Harry Potter is about three neophyte wizards, Book I in Bronny's promected series called The Arinthian Line is about neophyte warlocks. In this coming of age novel for anyone from tweens to adults, fourteen-year-old Augum and friends Bridget and Leera would love to be warlocks but their kingdom is in chaos. In an ancient, abandoned castle, they endure grueling training. That's only the beginning. An audiobook version of Arcane (The Arinthian Line, Book 1) has been narrated by Grammy winner Stefan Rudnicki, with classic full distribution via Blackstone audio. Sevor Bronny has clearly got the bit between his teeth when it comes to marketing and promotion. Or, at least, it certainly sounds like he does. He has provided the following advice to authors who want to produce their own books via the internet. - Do a Goodreads book giveaway (mine is HERE, for example) With almost zero promotion, my book has garnered 177 requests in one week. - Setup social media accounts. If you haven't already, create a public facebook author page, start a Twitter account, start a Pinterest visual inspiration account for your book (mine looks like this, for example: http://www.pinterest.com/sbronny/ ), and especially, make an author profile both on Amazon and Goodreads (as opposed to a regular user account). There are a slew of other social networks. Use as many as you like, but try to have them synched so you don't post on each one, but rather from one source that posts to all of them (use Hootsuite to do just that). - Rafflecopter promo (you have to be clever with these, but they're amazing for getting author signups and stuff). - Optimize Amazon keywords. This is actually quite important. There are tricks on how to do it optimally. As soon as I find the link to the thread I used, I'll post it here. - Gather reviews. Approach select fantasy reviewers on Amazon / Twitter / Goodreads / blogs and offering them a copy of the book, following these Dos and Don'ts guidelines. - Have your own author webpage with all your social media links at the top (examine mine here at severbronny.com for an example - notice the social media buttons and how easy it is to connect?) People are fundamentally lazy, so make it as easy as possible for them to connect with you on their favored platform. - Throw a release party in your house or a pub. Invite the public and all your friends. Make it a fun thing, not just about selling books. Make it about CONNECTING to people. Those connections are key. - Have a KILLER blurb and cover. If yours isn't amazing, start with this first, immediately. Post the blurb and cover in critique forums (like kboards / goodreads, etc). Take a whoopin', make it better, THEN promote. ALL OF THIS PROMOTION IS WASTED IF YOUR BLURB OR COVER IS WEAK! - Hone your craft. Assume you're a terrible writer. Read as many how-to-write books as you can, from trusted sources. I can't recommend Lisa Cron's Wired for Story enough, for example, or Elizabeth Lyon's A Writer's Guide to Fiction, or even Renni Browne's Self-editing for Fiction Writers. There is a fine line between arrogance and confidence. Quality is paramount, especially for your first book. It is the foundation of your brand and empire-woe be to your career and soul for presenting a weak product. I'm not saying I'm any good as a writer (that's for the public to decide), but I am saying I damn well did my best to be prepared! - Whatever you do, DO NOT PAY FOR FACEBOOK LIKES. There's already plenty of evidence out there indicating the likes come from places like India or other click-farms, and they actually reduce your exposure to your true followers because those fake likes do not pay attention to your page post-liking it. - Have a physical copy available. It makes your book and brand look professional, and also makes the digital ebook price look like a bargain. It's not as hard as I thought to format the thing for print, though you'll have to do a little bit of research on how to do it right. I used createspace. - If you have large page counts, for the love of all that is holy, check the template restriction page count on your print-on-demand printhouse! Turns out, at 5 x 8 inch format, max page count with createspace is 700 pages. Luckily I caught this in time and shrank my font size to 10 for book 1, so that it can stay uniform with book 2, which is twice as large. I have my wife to thank for spotting that one actually. - Run one last spell check on the final product POST FORMATTING. Formatting can bungle a few words here and there, so it's critical you do one last run-through before publishing. And for the love of all that is good, order a physical copy proof! - FRONTMATTER Have your copyright, Library Archives (CIP data in Canada), ISBN etc sorted out at least two months ahead of publishing. Do the same with your cover and proof copy (that last one I've failed at-MISERABLY). - PUSH YOURSELF! My goal this year is to complete my series for 2015, and have at least four of the books published. That's a substantial increase considering I've been working on them for three years without publishing a thing. And FYI: Goals only count as goals if there is a clear time frame and a clear outcome. - Respond to people! I learned this with my music, big time. When a reader sends you an email or a private message, it is CRITICAL for you to reply courteously. NEVER ANSWER REVIEWS. NEVER BE RUDE. From my experience, once you respond, you've increased the chances of winning them over for life by magnitudes. - Don't get too caught up with word count. This is a tough one, but I've discovered that writing for the joy of it is far more productive than trying to hit a daily word count (not to mention your output actually increases-just avoid looking at the actual total if you can). Find your joy and follow it. You make this all about performance and money and output, you're going to be one miserable you-know-what. If you love what you do (which will be writing 75% of the time, barring release weeks), then it's not a job at all, is it? It's a passion. - Avoid browsing the internet while writing. Scientifically, your brain actually changes when surfing the net. Each link provides a small endorphin rush, and so you are rewarded for skipping around. This is not conducive to long bouts of steady concentration on one topic. This point requires discipline. And yes, I still battle with this one like an angry chihuahua. - Read self-help books. Often the things that prevent us from succeeding have nothing to do with our craft or abilities. They're subconscious self-defeating loops, or mannerisms passed down from our parents, or assumptions we made about ourselves, etc. This point is a lifetime study, but makes a huge difference. If it's something you think you're capable of, I highly recommend it. It'll give you that edge over those incapable of bettering themselves. A transferable skill, so to speak. Honestly, interacting with people works best, from my experience at least. Being interested in their lives and what they're up to is key. You ever go to a party and there's that one guy who just talks about himself? It gets tedious really quick. Communication is a two-way street, and the more you ask about the other person the better off you'll be. Anyway, this is just my two cents. This list is by no means all-encompassing either. If you have a strategy that works, let me know and I'll add it to the list.